You might remember a while back that I did a review of a super cute Personalized Varsity Sports Cardigan from Custom Knits for Baby. I love this sweater and can't wait for winter so Jayden can wear it again. When I mentioned that I was pregnant with baby Evan Custom Knits For Baby was so kind as to make a special hat just for him. I love personalized items so I was excited to see what they would send. Is that not adorable!?! The colors are perfect together and having baby Evan's name on it makes it even more special. I was so excited that I just had to take it to the hospital for after his birth. I even picked a going home outfit around the hat so it would match well. The hat itself is made from 100% Cotton Yarn. It is super soft and surprisingly cool. There are a couple of added stripes for a fun sporty look. The hat is big, but looks great on baby boy. He will definately grow into it in the perfect time for this winter. You can also add a scarf to match. You can get it in preemie size up to adult. Now I just need a matching hat for Jayden, wouldn't that be cute!? How would you like to get a custom personalized knit hat from Custom Knits for Baby? Well, your in luck!! 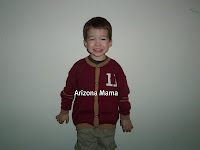 Custom Knits For Baby is offering 1 Arizona Mama Reader a Custom Personalized Hat. Enter in the Rafflecopter form below! This giveaway will be open until 9/8 at 12:01AM (EST). Thank you to Custom Knits For Baby for sponsoring this review and giveaway. I can get the hat in college colors, oh let the football wars begin again. I like the Personalized Cupcake Tee for Girls, my granddaughter is soon celebrating her first birthday. I would get the Rugby Striped Hat with Monogram for my grandson in gray, blue & green. I like the Custom Made Minky Blanket. I would get a black hat with the name in gray. I like the striped roll hat. =) Lime and pink is cute! I like that they let you pick the colors you want and they don't seem to have a limit on the number of letters in the child's name. I think I might do Purple with White letters. I love products that are made in the USA! I would get white, and haven't chosen the name yet. I would love to do a blue hat with the name Sam for my nephew! I like that they will work with you to create a look entirely your own. I like the personalized monogram beanie. I like the Duckie Hooded Towel. I like the Plush Personalized Bloom Baby Blanket. I love the Plush Personalized Owl Baby Blanket! I love the Personalized Star Hat! Too cute! I like that they have $5.95 flat rate shipping!